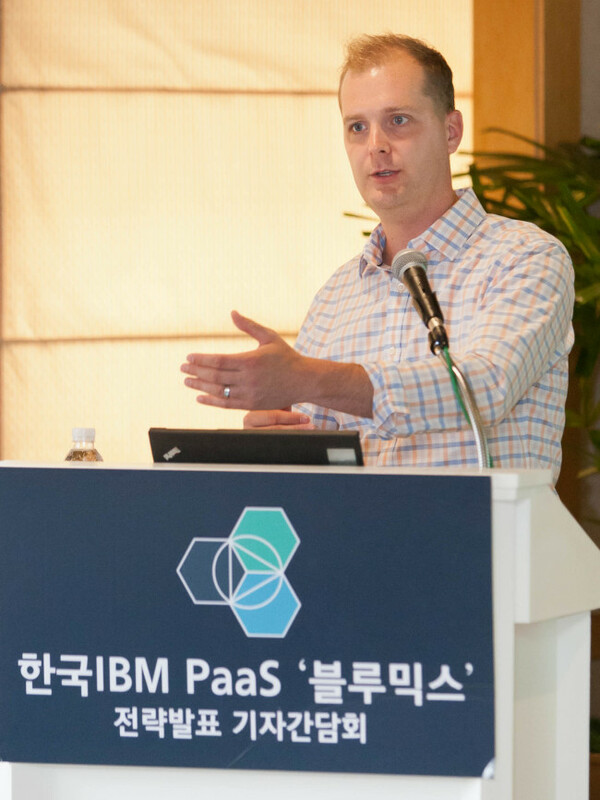 IBM launched Bluemix, an open-source cloud computing development platform, in South Korea on Thursday. The platform enables developers to create applications for smartphones, running on both Apple’s iOS and Google’s Android. More than 50 types of services are also available on the platform to develop applications for databases, the Internet of Things, big data and security. “Bluemix, which was launched in the U.S. in March, has received a very positive response. We are seeing a significant increase in the number of developers who use the development platform,” said Adam Kocoloski, chief technology officer of Cloudant, a database service provider. He hinted that the platform service will also be able to attract Korean developers and beat rivals such as Microsoft, Amazon and Google. Cloudant was acquired by IBM on the day Bluemix was launched. The CTO said IBM will take the platform to the global stage by launching it in other regional markets. “Bluemix lowers the bar (for small and medium-sized enterprises, and start-ups) to incorporate fairly advanced pieces of technology into their applications, making it easier to compose applications,” he said. IBM made a $1 billion investment in cloud computing earlier this year in an effort to bolster its business. A market watcher said that the launch of IBM’s new cloud platform service will prompt other competitors, including Amazon and Google, to expand in the Korean market.